Jelly meatballs? That was crazy talk. Surely she remembered the ones she made over and over seemingly every time. And surely they weren’t made with flippin grape jelly! After going back and forth, I was horrified to learn that the meatballs I so loved were, in fact, made with jelly. Grape jelly? How was it possible that grape jelly could be mixed with meatballs to be edible let alone delicious? I didn’t understand it. I wanted to fight it. But, as it turns out, some things are better off not fighting. Sometimes things that shouldn’t go together do to create something wonderful. And that’s ok. 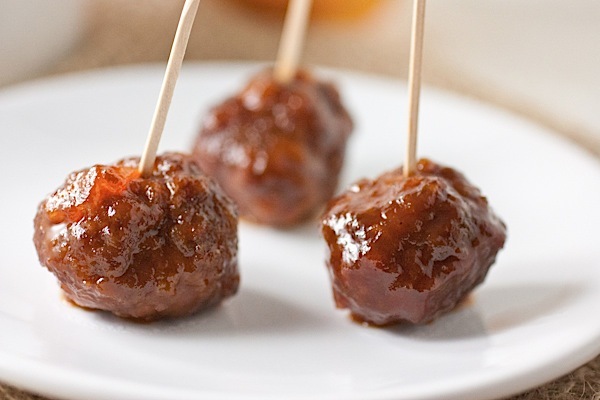 I decided to try to make these jelly meatballs, but I didn’t like what I was finding in the recipes coming up on Google. They were made with a mysterious concoction of sauces. And that didn’t bother me as much as the ingredients on these sauces. I’m talking all kinds of not-so-clean ingredients that seemed totally unnecessary for sauce. Additionally, if you opt to make the meatballs from scratch, this recipe will be even more clean eating approved. You can use store bought meatballs, but you should really check the ingredients. Or if you’re feeling lazy, just get them at a health food store, like Whole Foods, where they already sort out many of the more conventional options. As mentioned above, I decided to do a play on the famous grape jelly meatball recipe. The main ingredients of the original recipe are grape jelly, meatballs, and …wait for it…chili sauce. I know. Random! But, hey, it works. Anywho, I wanted to do something similar (still using jelly), but with a new flavor twist. 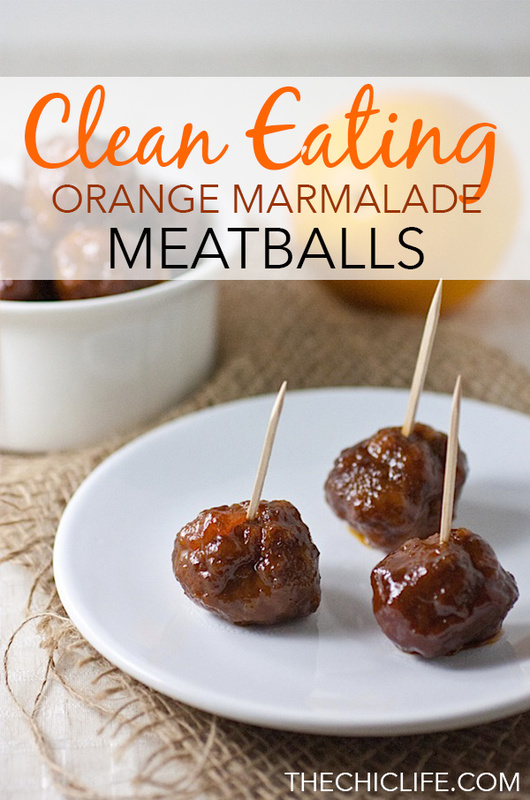 I decided on using orange marmalade for a tangy twist on this pot luck classic to make a Slow Cooker Meatballs with Orange Marmalade Recipe. I also decided, since I had the time, to make the meatballs from scratch, but you can use frozen ones if you’re short on time. Opt for from-scratch to keep this recipe clean eating. But you can find a pretty cleanish version at your local health food store. 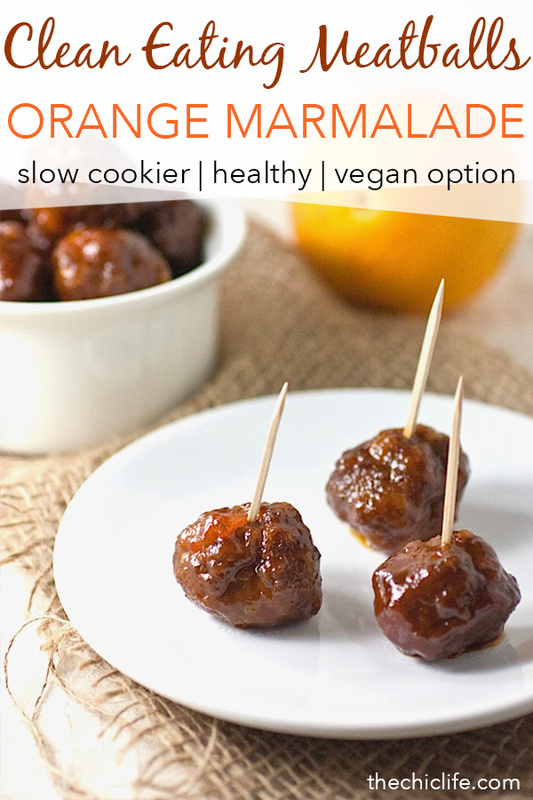 And you can even make this recipe vegan by using vegan meatballs! The result – a sweet meatball 10 year old me would have loved. 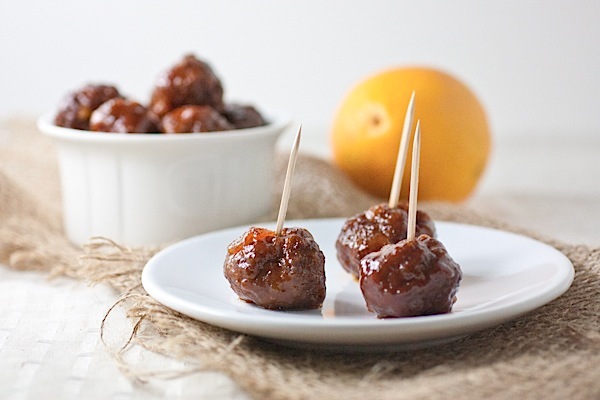 This Slow Cooker Meatballs with Orange Marmalade Recipe would be great to make when you’re entertaining or if you need to take something to a pot luck. They’re a great appetizer but could also work well for a more tapas or small-bite kinda meal. And I love this as a finger food for a holiday party! 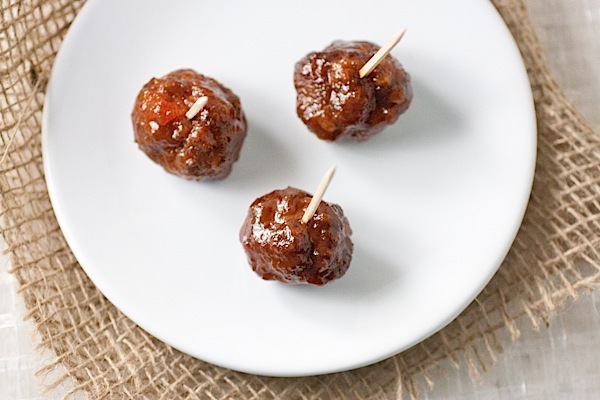 This recipe is a fun twist on the classic grape-jelly meatball recipe that most people have had at one pot luck or another. The orange marmalade gives the meatballs a lovely tangy flavor that still keeps the sweetness of the original version. And if you’re short on time, don’t worry about making the meatballs, just buy some frozen (and check out the alternate preparation directions below the recipe). Combine beef, bread crumbs, onion, egg, garlic, salt and pepper. Using your hands mix until evenly combined, but try to not overmix. 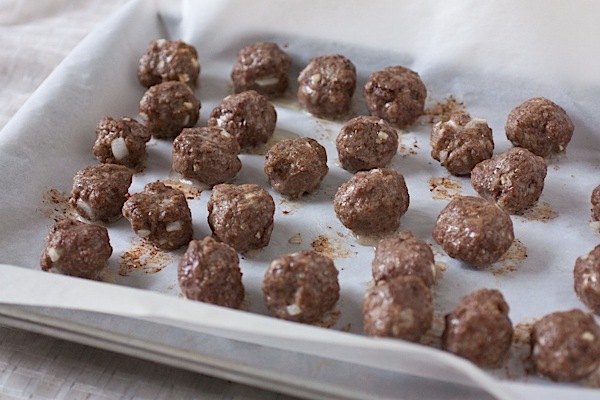 Form into 1 inch meatballs and place prepared baking sheet (use non-stick spray or parchment paper). Bake 10 minutes, turn, bake 10 additional minutes. In a large bowl, add marmalade, ketchup, soy sauce, and pepper. Stir till mixed well. Prepare slow cooker with non-stick spray. Add baked meatballs and sauce. 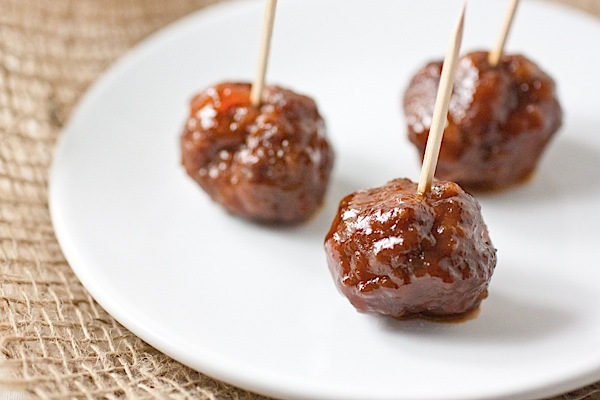 Stir to coat meatballs. Cook on high one hour. Add frozen meatballs (no need to defrost!) to the slow cooker with the sauce from Step #3 above. Cook till meat is completely cooked/warmed through – on high for about 2 hours or low for about 6. Note: 1 hour (cook time in slow cooker for from-scratch meatballs) / 2 hours (cook time in slow cooker for frozen meatballs). Note: Save prep time by using frozen meatballs, but do note – they will take longer to cook. Thanks for stopping by and reading! 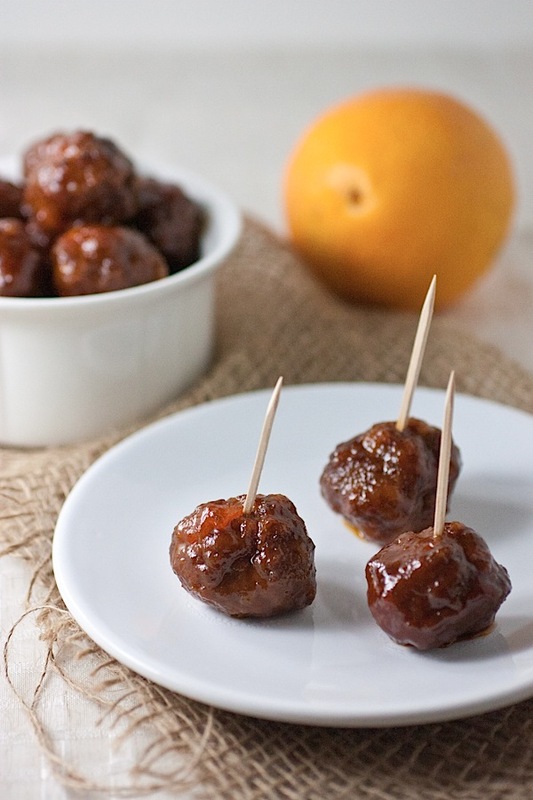 Hope you enjoy this Slow Cooker Meatballs with Orange Marmalade Recipe. What do you think of jelly meatballs? Love them or hate them? These are adorable in a way that makes me want to eat like 10 of them! I think orange marmalade must be one of those things lost on our generation. My dad loves the stuff! I never liked it till recently, but it’s one of my favorite jam/jelly flavors now! i found if you shred the onions (with a cheese grater or in the food processor), it makes the meatballs (or burgers) more moist and hold together a little better. I will definitely have to try these. they look amazingly delicious. I could eat about 16 right now! Sounds like a yummy twist. My family likes the Red Plum Jelly & BBQ sauce combo. We’ll have it with rice for dinner. Even on my husband’s top 10 list! Ooh – that sounds like a great combo, too! I have yet to try red plum jelly, but I really want to soon! Terrific! Just what I needed for my party today! This sounds great! How many does this make? I got some delicious homemade orange marmalade from home-grown oranges from a friend. I have plenty, so was looking for recipes. Just wondering if I should double it! Hi Shawna, I forgot to count them! 😛 But, I think it made just over 30 pretty small meatballs. It’s been awhile, but I think I remember thinking it would be better to double if you’re entertaining a fair number of people. Let me know how it works out! 🙂 Thanks for stopping by! Thrilled to find this recipe! 🙂 What size slow cooker do you use for this? 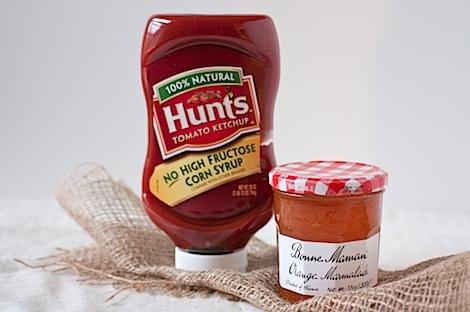 Can you skip the baking and do the cooking with the sauce in the crockpot? Hi Ashley! Good question! I know you can put the meatballs directly into the sauce if you’re using frozen meatballs. I haven’t tried putting raw meatballs with the sauce into the slow cooker. I think the baking sort of sets them. I wonder if you skipped that if they would fall apart during cooking? Could you maybe try sauteing them to brown the outsides a little? Side note: I think the pre-slow-cooker cooking can help add a little flavor thanks to the browning. Let me know if you try an alternate preparation! Thanks for stopping by!